In today’s post: Need a cute birthday cake but a little lacking in cake decorating skills? Me too! 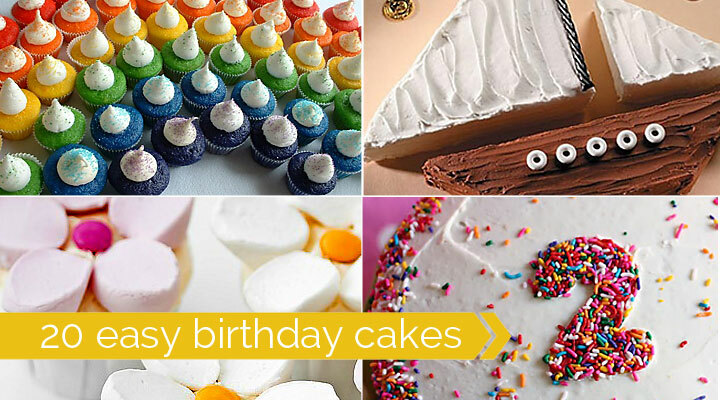 Find 20 super easy birthday cakes that anyone can decorate. I’m absolutely terrible at decorating birthday cakes. Honestly, I am. Luckily for me, my kids are terribly sweet, and will swear up and down that the awful looking cake I made is really just what they wanted. 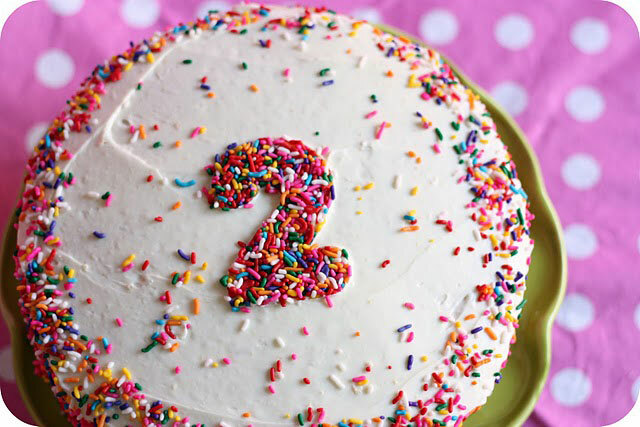 But I’m tired of making ugly cakes, so I’ve gathered up 20 birthday cake tutorials from Pinterest land that actually look easy enough for me to decorate without messing them up. 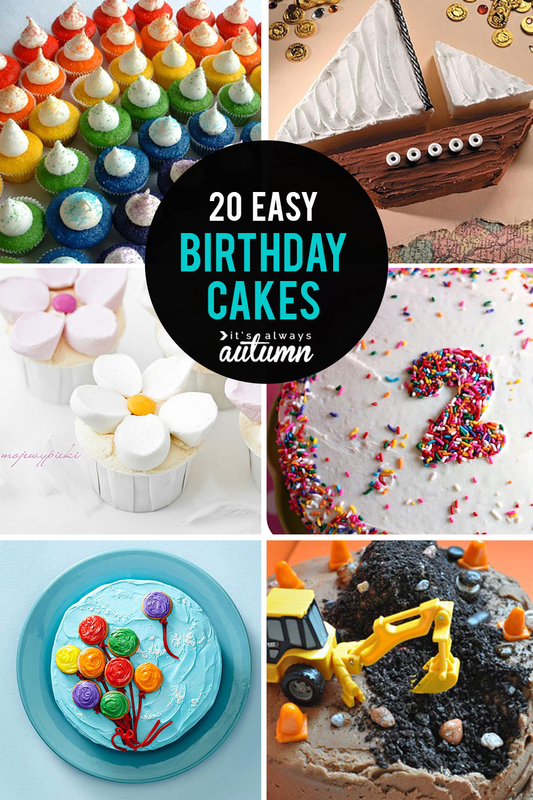 I’ve got to tell you, I found hundreds of cakes labeled “easy”, but only 20 of them made the cut for this post, and here’s why: lots of blog posts about cakes SAY they are easy to make, but I’m not buying it. For example, making six colors of fondant and then rolling it out and cutting into a gazillion different shaped pieces does not look easy to me. Neither does piping out enough frosting using a star tip to cover Elmo or Cookie’s head – I can guarantee that will end in disaster if I try. So I present to you 20 easy birthday cakes that actually look easy! 1. This easy birthday cake idea from Little Life of Mine is brilliant. Make the cake, frost it, use a cookie cutter as a template for sprinkles, and you’re done! Such a pretty, professional looking cake with such little effort – I’m in! 2. This birthday cake is completely covered in sprinkles, which means it hides any imperfections in the frosting. Endlessly Inspired shares tips for getting this look in just 10 minutes. 3. Are these little crab cakes adorable or what? I could easily see my kids having a great time putting together the crabs for me while I bake cupcakes, frost them, and dust with graham cracker crumbs. Easy and fun to do together! From Clean and Scentsible. 4. Here’s another cupcake option, this time from Betty Crocker. Cupcakes are arranged in the right shape, then frosted to look like a shaped cake (much simpler than cutting a cake to shape and trying to frost the cut sides). 5. Ever seen those amazing rainbow cakes people bake in six different colored layers, then stack with white frosting? They’re beautiful, but the thought of getting 6 different layers baked, then out of the pans without any of them breaking would kinda stress me out. 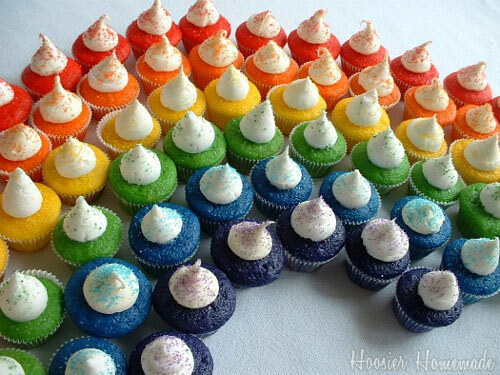 These rainbow cupcakes from Hoosier Homemade seem much simpler while still super cute. 6. 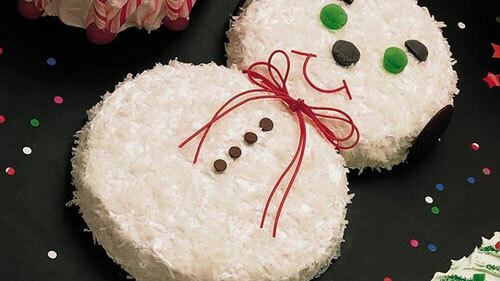 This easy snowman cake from Betty Crocker would be perfect for a winter birthday, and it looks supersimple to make using white frosting and coconut. 7. 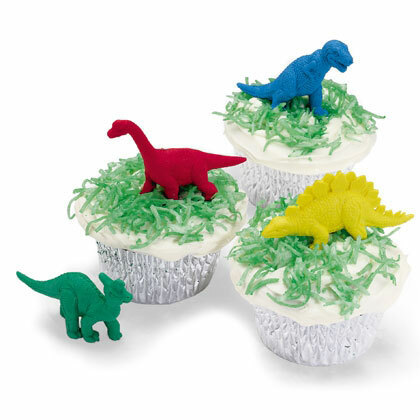 Here’s another great idea for coconut: mix in a little green food coloring and use it as grass – then top with dinosaurs or other small animals (you could even use blue coconut and top with sea creatures or Swedish Fish!). Idea from Spoonful. 8. This balloons cake is so pretty! Instead of trying (and failing) to pipe perfect circles onto a cake, just frost vanilla wafers and place them on top. 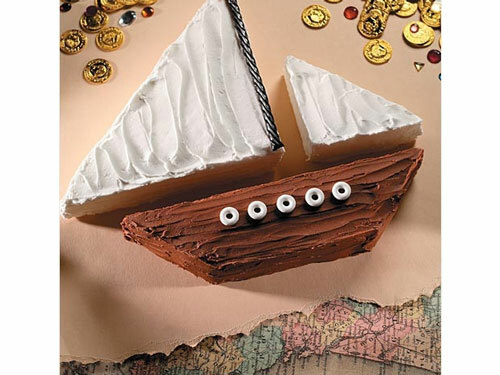 Easy birthday cake idea at Better Homes and Gardens. 9. 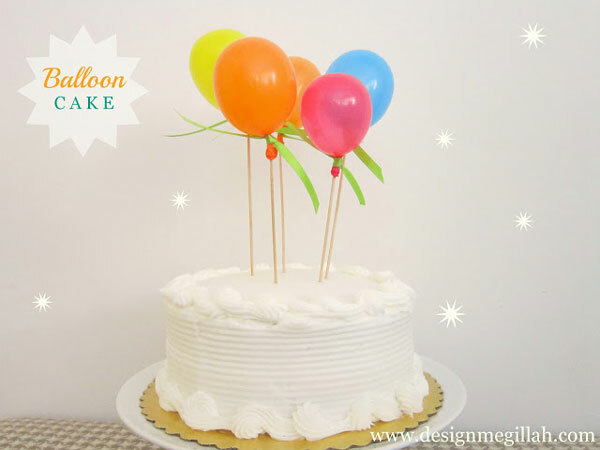 Balloons are perfect for cakes – so how about using real ones? 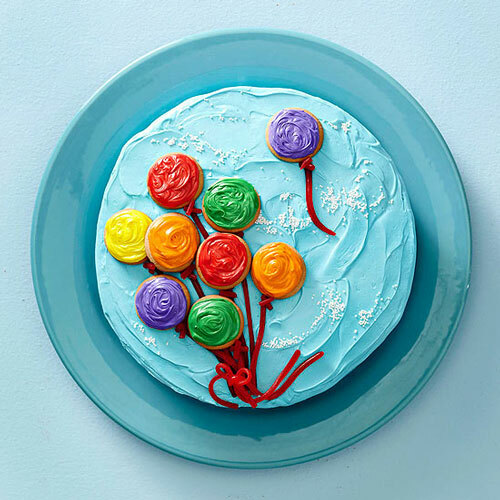 Water balloons tied to wooden skewers are just the right size for decorating a plain white cake. Idea from Design Megillah. 10. 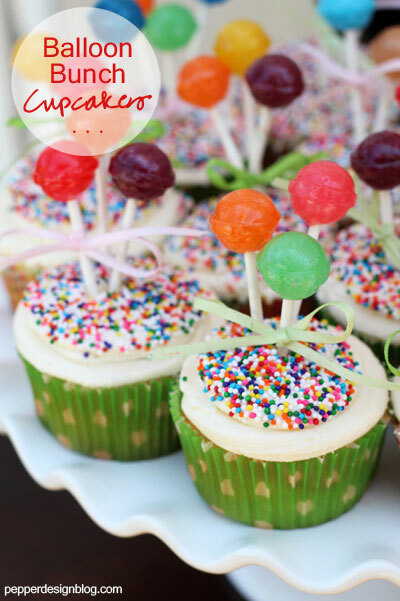 For another twist on a ballon cake, try these adorable balloon bunch cupcakes from Pepper Design Blog – just dunk a frosted cupcake in sprinkles, then stick three dum dums in each one. Click over for recipe and frosting tips. 12. 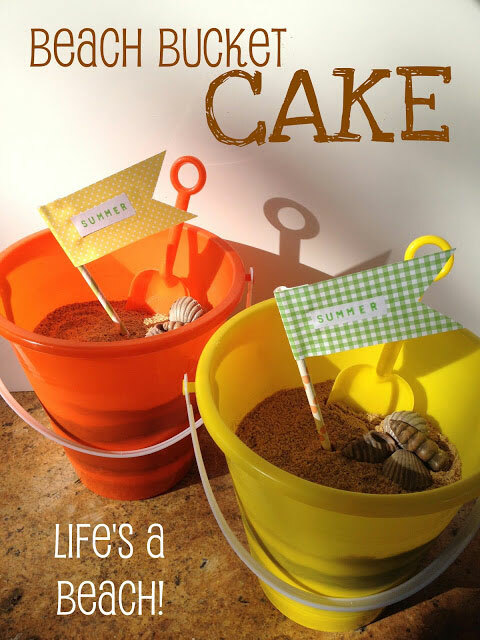 Check out the beach bucket cakes from Rook No 17 – they look just about impossible to ruin, and kids will love scooping up cake with a shovel! 13. 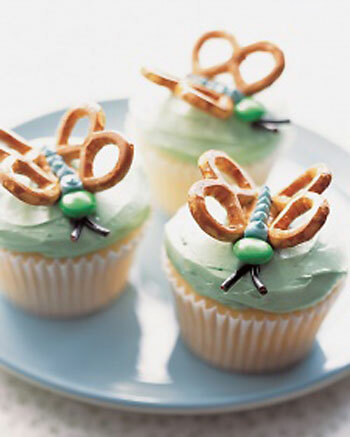 Normally when I’m looking for easy, I don’t turn to Martha Stewart, but these butterfly cupcakes look totally doable and quite lovely! 15. 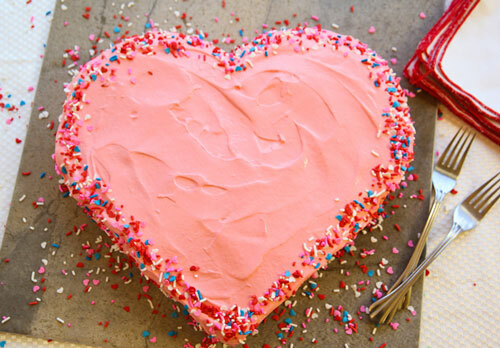 This heart shaped cake from Better Recipes is meant for Valentine’s Day, but I can see plenty of little girls enjoying it for a birthday. The best part? No special heart-shaped pan required. Click over to see how easy it is to make with standard pans (and you don’t have to frost any cut edges!). 16. So cool, right? 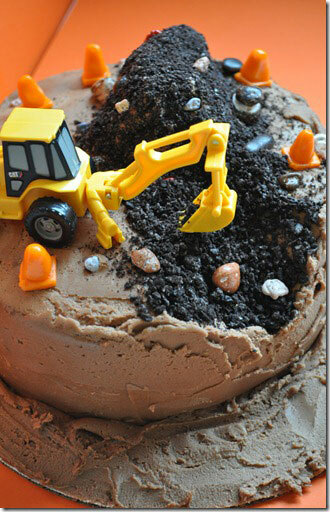 My 5-year-old son would LOVE this construction cake from Fredelicious, and I wouldn’t have to stress about making everything perfect. 17. Texas Monkey is a genius! She shows you how to hide any and all imperfection in a cake by wrapping it in candy and topping it with more candy – ending up with a very swanky looking cake in about 15 minutes. You have to click over to see all her other versions of the same idea. 18. 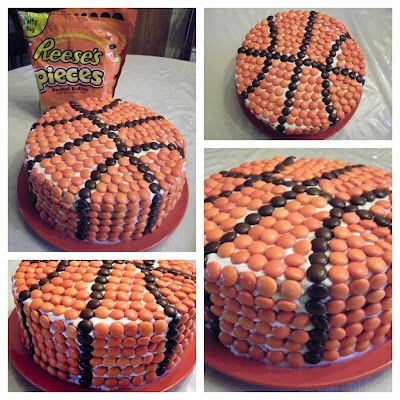 This totally awesome basketball cake from Follow Eric might take a little time, but it looks pretty easy to execute. Think how simple a baseball cake would be using white frosting and red M&Ms for the stitching! 19. 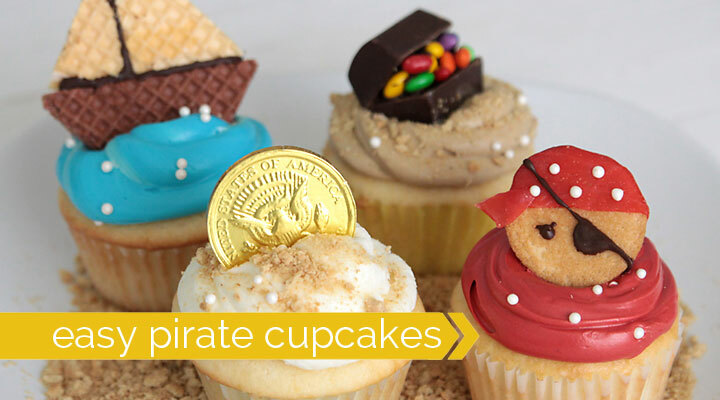 I recently made 4 different types of pirate cupcakes, and they were all super simple! 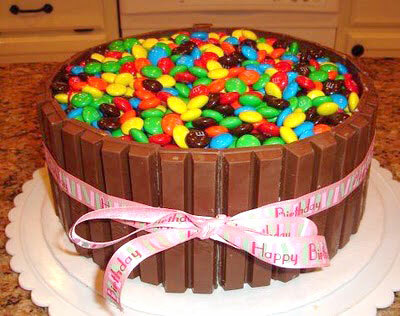 Have any great easy birthday cake ideas? Links to photos on your blog? Leave them all in the comments so we can check them out! Such fun ideas! Thanks for sharing my Rainbow Cupcakes! 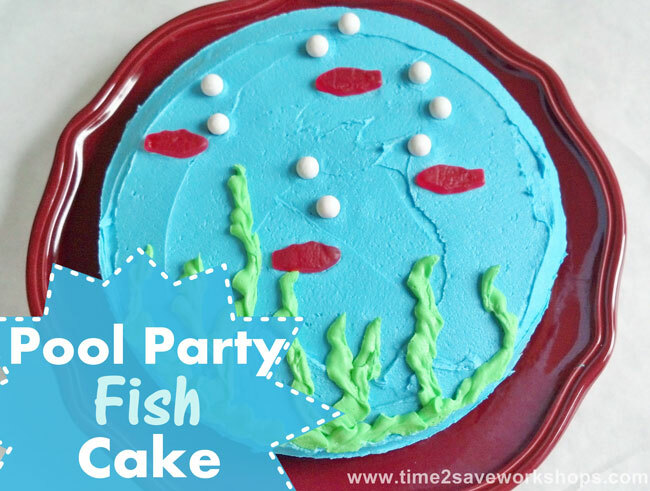 A great list of ideas – I love easy cakes 🙂 Thanks for sharing my fish cake! 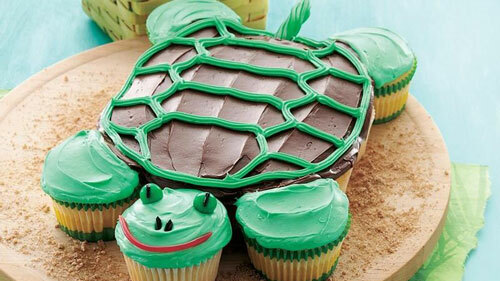 All these cakes/cupcakes are adorable and look pretty easy. Good gathering!!!! 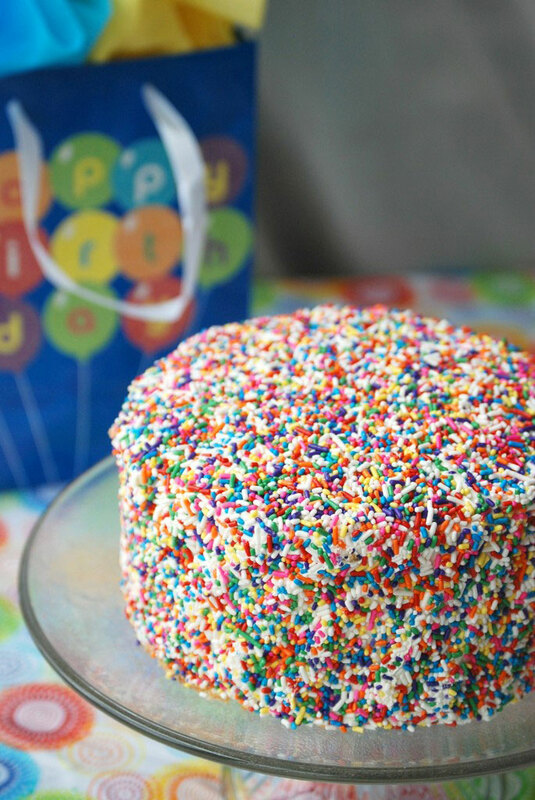 Thanks so much for featuring my Sprinkle Cake! I love all of these ideas so much!! This is an awesome list! I’m not a very creative person but I do enjoy trying to make my kiddos fun birthday cakes every year and this gives me some fresh ideas- all ones that I should be able to pull off. Thanks! 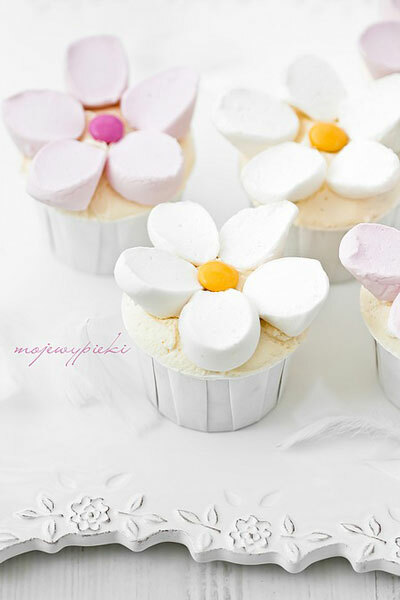 Thank you so much for including my cupcakes – this roundup is terrific! 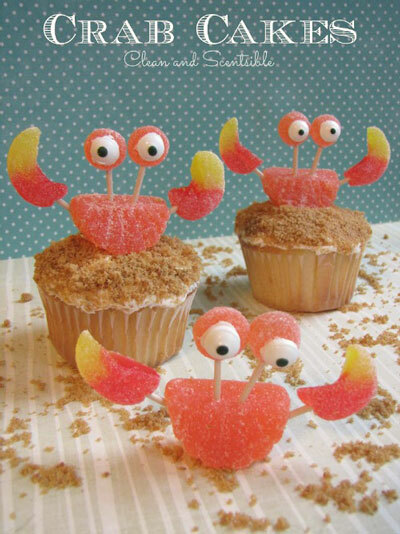 I love those crab cupcake toppers :). Thank you so very much for sharing your amazing ideas for simple cake decorating!! I honestly don’t know how most people don’t pull out their hair trying to make everything perfect (like in magazines, i have tried, badly.) or you will be a complete failure (i’ve felt that way too) at something you eat anyway! I’m absolutely terrible at decorating birthday cakes. Honestly, I am (check this out if you don’t believe me). Luckily for me, my kids are terribly sweet and will swear up and down that the awful looking cake I just made is really just what they wanted. But, just so they don’t have to keep consoling me when I make ugly cakes for kids. First there was her German Chocolate Cake with Broiled Coconut Frosting that was out of this world good. I mean broiled … She wants it to be sacred and only served on her birthday… it is HER birthday cake after all. In fact, she has …. this for her birthday! Thanks for sharing at What’d You Do This Weekend. Such a nice cake decorating ideas. Really awesome. Thank you so much. Thanks for catching that! I’m using a new recipe card and I think it got cut off. I’ve update it now.